Multi-Purpose Camera For Occasional Users. There are many options in the App Store to replace iPhone’s native camera, but how many among them are actually do-it-all? One app is excellent for taking photos, but it doesn’t take videos; another takes both but you cannot apply processing; a third allows processing but it doesn’t allow sharing. And so on and so forth. Camera Genius by CodeGoo is one of these multi-purpose cameras meant to effectively replace the native app, throwing in more features in order to let users take, edit and share their photos and videos, all by opening a single app. Share via email, Facebook, Twitter, Flickr, Picasa, Mobileme, Tumblr. The developers conceived Camera Genius as a multi-purpose camera able to give iPhone photographers all sorts of features, commonly available only to those using several different apps at the same time. The intention is commendable: who wouldn’t love to have things made as easy as they could get? Camera Genius, which comes with two different skins — the default light grey and a greenish alternative one — allows video and photo taking, a rarity among photographic apps. It also allows processing and sharing of previously taken shots. The camera is optimized to help you take the best photos with the littlest effort. The UI is clear, uncluttered and it works quite smoothly — although the app did crash on me a few times when I was playing with exposure controls. 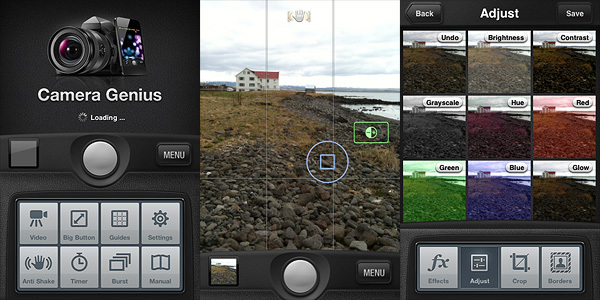 Among the features of Camera Genius, you have anti-shake, timer, full-screen shutter button, burst mode. The in-app manual will help you getting the hang of it quite easily. The effects are all right. I am very much against the idea of having ready-to-use filter/border combinations; thankfully not all effects merge the two together: there are borders and filters you can use independently. I said effects are just all right. 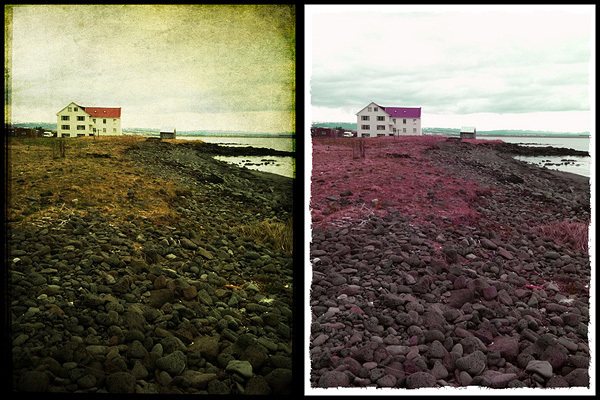 In fact, there are more than a few apps out there whose same effects — black and white, 70’s, sepia, lomo, etc. — are by far more convincing and better looking. The selection is OK: it’s the quality and the customization that doesn’t really stand out. Not to forget, you cannot process videos, at least for the present moment. Is Camera Genius a good substitute for the native camera app? Yes, it is. It takes photos and videos and it has some extra features, like stabilizer, burst mode and exposure control, that are definitely an upgrade from iPhone’s native app. Taking photos can sometimes be a hassle for iDevice aficionados: Camera Genius, with its many tools, greatly improves the overall experience. Will Camera Genius replace all my photo apps, so that I can only use one? This, I think, depends on what kind of use you intend to make of your photos: if you just take a few sparse snapshots or if you’re just into sharing your instant memories with your friends on Facebook, Twitter and so on, Camera Genius has good chances to become your ultimate app. However, if you’re more creative and you like to experiment or if you intend to convey feelings and atmospheres with your photography, I highly doubt Camera Genius is the app for you. Even in this case, a bunch of CodeGoo’s app features will perhaps come in handy now and then, but as far as editing and post processing are concerned, what Camera Genius offers is just a little above mediocrity.